The Clouded Leopard and Small Felid Conservation Summit was held January 28 – 30 at Kasetsart University in Bangkok, Thailand. 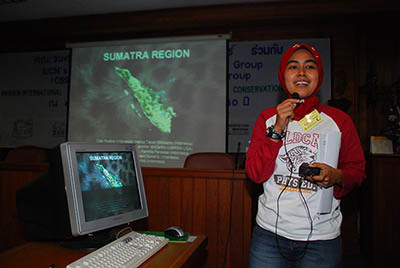 The workshop was conceived to compile current information and address the conservation issues facing the nine species of Southeast Asian small wild cats. In addition, the meeting sought to facilitate information exchange, communication, and collaboration among the many independent parties working with these species. The Summit was organized as a three-day workshop intended to serve as a first step toward the development of a holistic conservation strategy for small felids in Southeast Asia. Kasetsart University’s Faculty of Forestry invited IUCN's Conservation Breeding Specialist Group (CBSG) and IUCN’s Cat Specialist Group to facilitate this workshop. Using CBSG tools and processes designed specifically for this type of conservation issue, the workshop brought together a diverse group of 65 participants from 13 countries including field ecologists, population biologists, naturalists, conservation education teachers and zoo professionals. 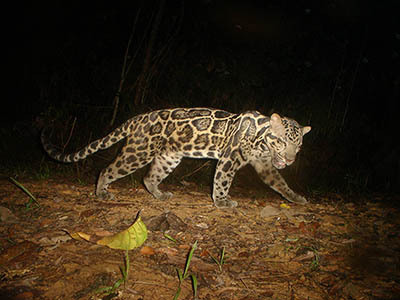 Southeast Asia has tremendous diversity in wildlife and is particularly rich in felid species, including nine species of small or medium size wild cats: clouded leopard (mainland SE Asia), Sundaland clouded leopard (Borneo and Sumatra), marbled cat, jungle cat, golden cat, flat-headed cat, fishing cat, Bornean bay cat and leopard cat. Recent findings from field surveys and wildlife trade monitoring indicate that many of these felids may be facing significant population declines due to the impacts of habitat destruction and fragmentation, declining prey base, and targeted hunting. The table below outlines the conservation status of these species according to the 2008 International Union for the Conservation of Nature (IUCN) Red List. Accurate assessment of the conservation status of these species is difficult as little is actually known/reported about their natural history, relatively few field surveys have been undertaken, and many of these species have large historic geographic ranges. Due to the wide complement of habitat types utilized by many of these species, the variation in the quality of remaining habitat, and the relatively low natural abundance of these species, it is problematic to generalize survey findings for areas outside study sites. In addition, much of the recent data on the distribution of these felids have been acquired in the course of research on large felids (especially tigers) or non-felid species and is not always disseminated to parties addressing small felid conservation and research issues. As a result, there is a lack of data on the distribution, status, and ecology of small felids to inform conservation planning for these species. 1. Bring together government agency employees, field researchers, educators, NGO, and zoo staff currently working on (or interested in working on) clouded leopard and small felid research and conservation issues in the Southeast Asian range countries of Thailand, Malaysia, Indonesia, Vietnam, Myanmar, Laos, Cambodia, and Bhutan. 3. Identify key issues concerning the conservation of clouded leopards and small felids, particularly relating to field study, trade, and community education/social marketing. 4. Provide an opportunity to showcase clouded leopard and small felid research and conservation efforts to the public via media participation in the meeting. During the workshop, participants worked in small region-based groups to summarize all available information about the focal species. These data were used to update current range maps for these species. 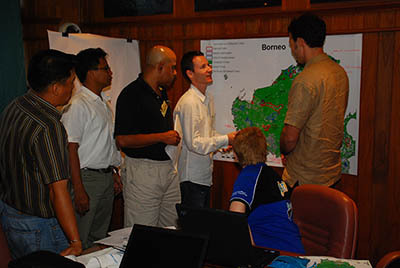 In addition, the major issues relating to clouded leopard and small felid conservation were identified and prioritized. Based on these results, participants developed goals to achieve the desired change in the conditions identified in the issue statements. Finally, each group developed specific actions, relevant to the situation in the various range countries, to accomplish the goals, taking into account the scientific information on the species, their habitats, and the threats identified.